Austria has a lot to offer the skibiker, it is after all where Engelbert Brenter patented his "Sit-ski" on March 10th 1949. It has a profusion of resorts which, thanks to the country's long history of ski bobbing, are (mostly) skibike friendly. In Austria almost everything works to Swiss levels of efficiency, but for budget prices. The roads and pavements are obsessively cleared of fresh snow, the trains run to the second and the bread is always fresh in the morning. Lift pass prices are comparable to France but food and drink, whether on the mountain or in the village, are noticeably cheaper. There's a jollity to the mountain resorts, the ompa band still lives on, although today it rocks to an electro beat. Many ski resorts in Austria are situated at below average altitude; this can create in poor snow conditions and ice can be a serious safety concern for a skibiker. To counter this most Austrian resorts have invested in extensive snow making facilities that would be the envy of other countries. Furthermore Austria is also home to a number of high altitude glacier ski resorts, some of which are open 365 days a year. Ellmau is a popular ski village on the northern side of the massive SkiWelt area, situated in an attractive setting just off the main road between St Johann and Wörgl. Ellmau has gained a reputation of being a favourite destination for families. 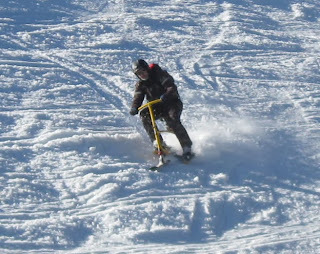 Skibob hire facilities are available in Ellmau from Snowbike Wilder Kaiser. The Hintertux Glacier is Austria’s only year round ski resort and offers winter sports enthusiasts snow-sure runs 365 days a year. When conditions are good at Hintertux you can ride from the summit at 3244m, right down to the base station at 2031m, an impressive 1200m of vertical difference. The base station is modern and efficient, but it is not a particularly charming spot. Accommodation will be found lower down the valley around the town of Tux, after which Hintertux is named. Innsbruck is the regional capital of the Tyrol and calls itself "Capital of the Alps". It has an excellent public transportation system which seamlessly integrates with the mountain infrastructure. It takes just 1 hour to get from the airport to the peak of the Nordkette, Innsbruck's local peak. Innsbruck is excellent for long weekends (from UK airports) for skibike instruction or recreational riding. Innsbruck has an efficient local Brenter agency with full training available. Kaunertal lays claim to being the Tyrol's youngest glacier. It is just 100 km from Innsbruck and 190 km from Munich; although the ski area is somewhat remote. It can take 30 minutes to drive up a rough track to the Kaunertal parking area and chairlifts. Furthermore this road can get very congested at peak times. Kaunertal offers good value, un-crowded and varied riding; in a natural wilderness, unspoiled by over development. Kaprun is an attractive traditional town with its own family ski area on the Maiskogel peak conveniently accessed by chairlift from the centre of town. It can be a useful bolt hole during stormy weather, due to lower and more sheltered slopes than the neighbouring areas. A combination lift pass is available to include nearby Kitzteinhorn and Zell-am-See. The Kitzteinhorn is a high altitude glacier ski station a short drive from Kaprun. Access to the ski area is by cable car from a base station in the valley below. A combination lift pass is available to include nearby Kaprun and Zell-am-See. Leogang is well known as a summer mountain biking destination, so it should come as no surprise that it is equally skibike friendly in the Winter season. Leogang has plenty of long, intermediate level, tree lined runs, so is ideal for skibikes. It is on the edge of a circuit that connects with Saalbach & Hinterglemm giving the option for huge touring potential. 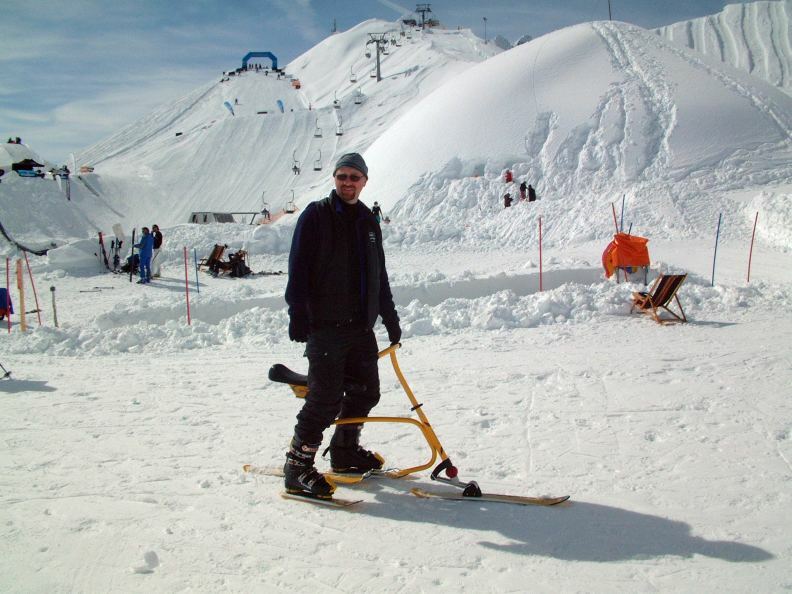 Skibiking is allowed everywhere at Obertauern, skibike hire and instruction are available at Ski School Koch. Obertauern - snow is guaranteed. The Pitztal glacier at Rifflsee is the Tyrol's highest glacier, which gives it a long season from September through to May. In high winter there are itinerary routes all the way back to the car park, yielding full benefit from the 1700m of vertical difference available. Though during the shoulder seasons the sole uplift from the car park can become overloaded, leading to lengthy queues. Like many Austrian resorts Saalbach-Hinterglemm has a pretty, traditional-style village and very lively nightlife, but unlike many it combines this with a very extensive circuit of slopes on both sides of a valley. The runs at Saalbach-Hinterglemm are linked by an efficient modern lift system. Its slopes resemble a French resort more than a traditional Austrian one butwith the added advantage of some excellent mountain restaurants dotted around. Sautens is located at the entrance to the Ötztal valley at 810m above sea level, it is the perfect place for all those in search of truly relaxing winter holidays, away from the valley's major tourist centres. This romantic little village makes a wonderful base for excursions to the nearby ski areas. Free skibus shuttles take you to the family ski areas of Hochoetz (2 km) and Kühtai (18 km) where snow is guaranteed throughout the winter season. Sölden is Austria’s first winter sports resort to offer the keen skier 3 superbly developed 3000m high mountains, known as the BIG3. Innsbruck Airport is just 1 hour by car from Sölden. St. Anton encompasses approx. 50 km² (including off-piste areas) from 1,500 m altitude up to the Valluga peak at 2,811 m. A single ski pass covers the entire Arlberg ski area with more than 280 km of slopes. The longest downhill run (8.5 km) with a vertical drop of 1,350 m leads from the Valluga mountain via the Ulmer mountain lodge to St. Anton am Arlberg. The Stubai glacier is Austria's largest glacier skiing area, it is just 45 minutes from Innsbruck. Riding is possible from 1750 - 3210 meters with guaranteed snow from October to June. The uplift from the car park to the slopes is quite lengthy taking around 45 minutes. The attractive lakeside town of Zell am See has it's own ski area on the Schmittenhöhe, which can be accessed from various points around the town. The easiest runs are to be found high up on the mountain, those lower down can be quite taxing, especially during times of poor snow. It is possible to avoid these runs by descending by gondola. Lift tickets are available to include the neighbouring runs at Kaprun. The nearest airport is Salzburg, with public transport connections to Zell am See by train or bus.